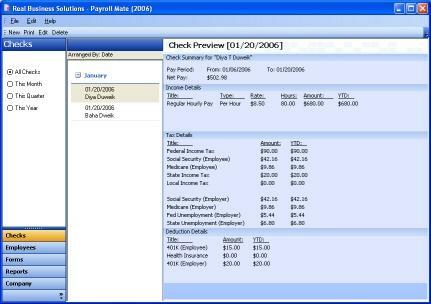 Payroll Mate is easy to use, yet powerful software for payroll. This payroll software supports multiple companies with multiple employees. Hourly, salaried, bonus, sick, other pay and unlimited number of user-defined income types. Unlimited number of user-defined deduction and tax types including taxable and allocated tips. This payroll software also supports user-defined Income, Tax, and Deduction categories making it very flexible and powerful. *A step by step, easy to follow wizard guides you through the company creation process. Each newly created company is automatically filled with a number of default Income, Tax, and Deduction categories, including federal taxes to save you time and effort. *Allows you to create an unlimited number of fully customizable Income, Tax, and Deduction categories making this payroll software extremely flexible to fit exactly your payroll needs. *Automatically calculates Federal Withholding Tax, Social Security and Medicare Taxes. *A step by step, easy to follow wizard guides you through the process of adding new employees and deciding appropriate Incomes, Taxes, and Deductions for each employee along with their values. Fully automated payroll software with built-in time recorder. No monthly fee. Payroll Mate? is a compressive payroll and check printing software. Do not make war, but play Matego and improve your math! Animate Me! can create GIF and AVI animations on the base of predefined effects. MyListMate helps you save time and money with your grocery shopping! Qweas is providing links to Payroll Mate 2010 4.0.20 as a courtesy, and makes no representations regarding Payroll Mate 2010 or any other applications or any information related thereto. Any questions, complaints or claims regarding this application Payroll Mate 2010 4.0.20 must be directed to the appropriate software vendor. You may click the publisher link of Payroll Mate 2010 on the top of this page to get more details about the vendor.